Double Dragon. Richie from Happy Days takes on a sad chocolate-chip cookie. Sorry normal people, but this tale will really only appeal to nerds and only male ones at that. For everyone else, I give you gardening. I know on some level that’s discriminatory, but I guess in the end I can’t force you to read something else. When we weren’t wasting our teenage lives in front of someone richer’s various Nintendo systems, we were wasting our pocket money at the Arcades. I say pocket money. I really mean whatever change there was from going to the shop for mum (which quite often was a sizable amount.) I don’t know why Mum & Dad never asked for change; but I guess they would have if they wanted it. And it wasn’t unheard of back then for a bag of sugar to cost $67. Inflation an’ all. Way before the MK days, back in Australia in 1986, our local arcade had 2 games: Double Dragon, and some other crap game of no consequence. 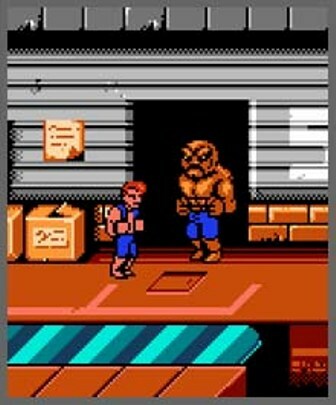 Double Dragon is undoubtably the greatest game of all time. It had an Oscar-Worthy plot involving some politician’s daughter, who happened to be your girlfriend, getting kidnapped. I think. All I remember was that saving her would obviously require dispensing inordinate servings of violence on the oncoming masses. You walked around beating people with assorted weapons: fists, chains, bats, Amy Winehouse. You get the idea. It sounds disturbing, but anyone you hit just flashed a couple of times and then disappeared into thin air. Like real life. It was hard to tell what was going on most of the time anyway, since there were always about 19 sets of identical twins on the screen trying to make you die. I didn’t understand how so many people that looked the same could all hate you. Like real life. At the end of each level some huge guy came along who hated you too. And your Mum. At that point you hated your playing partner even more, because inevitably they had died already and needed more coins to continue. So you took on beat-zilla by yourself and got smashed to a pixelated pulp. And started again. From the beginning. Violence in video games doesn’t make kids violent. Spending $183 on the same stupid level makes kids violent. This is all just rumours and hearsay of course. I never personally played Double Dragon, since it could have had a negative effect on my childhood and my parents would never allow that. Consider if you will, that my childhood back then involved finding live .22 bullets in my friend’s Lego box and hitting them with a hammer. Shooting them up the street at whatever may have been walking by. Mum & Dad really needed to re-focus. And maybe do a better job of parenting. Just sayin’. Tekken: known for it's realistic fighting. Here, Capt. 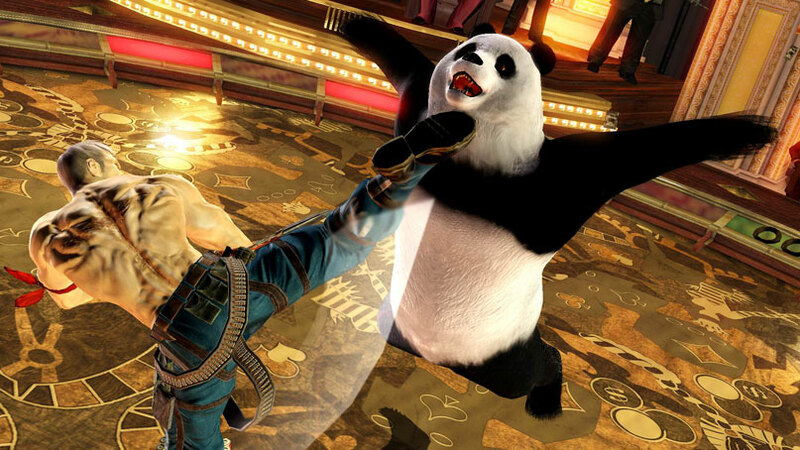 Plausible Back Muscles kicks a flying Panda in the throat. Skip forward 10 years and sideways about 12,000 miles, and Chris & I were kings of the local arcades. Double Dragon was long gone and replaced by more realistic games like Tekken and dozens of other character-building love soliloquies. Bolivia had arcades everywhere. We spent many afternoons shooting tokens into the machines, a very important tool in our belts: Passable English. The arcade cabinets had all the special death-inflicting moves laid out around the screen, so if you could read them, you were miles ahead of your competitors. At least that was the idea. We would usually battle it out for a while, until some tiny Bolivian kid would take pity on us wasting all that coin and trounce us both in a minute and a half. I didn’t understand how these kids who were supposed to be poor could have enough coins to become complete legends at arcade games. No matter how good we were we always got beaten by someone requiring a stool to play. It was embarrassing, but you told yourself it was only a game, held your head high and remained calm. In truth the kid probably had at least 1500 midget friends who could appear out of nowhere in an instant, and beat you in a minute and a half for real. Thinking about it now, they probably got free games the whole time; employed by the arcades to sucker idiot-foreigners into blowing wads of dough. Like those beautiful women at casinos. Or thin staff at Krispy Creme. Nowadays you don’t really see arcades anymore. There’s a Wii in every household from Alaska to Argentina, so there’s really no need to leave the home for wanton, caricatured violence. There’s enough wanton violence under your own roof with people getting beat in the head by those Wii Remote things. And and least playing games in your underwear is legal at home. Even we were in High School we could play Street Fighter II on Luis’ Super Nintendo. We played so long eventually we wore our thumbs down to little stubs. Some doctor looking for glory even coined a term for it. I wanted a Super Nintendo so bad as a kid. Instead we got a chinese old-school Nintendo knock-off whose box made strangely ambiguous claims about containing 300 ‘different’ games. In reality it was 3 games, and a hundred repetitive levels of each, none of them in order. We hated our lives that day. I looked all through our lego box but came up empty on bullets. Mum & Dad must have been picking up their act. Posted in Bolivia, Stuff & ThingsTagged arcades, double dragon, street fighter, tekken, violenceBookmark the permalink.